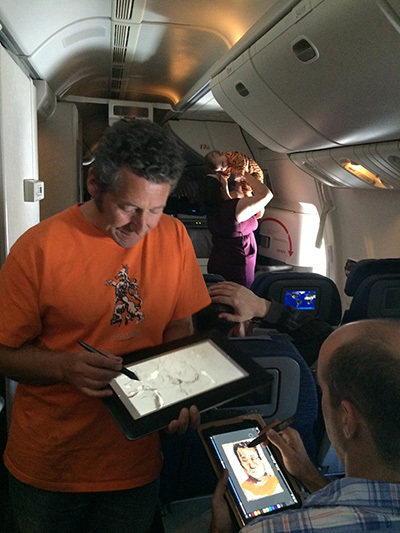 This portrait was created from life on a plane journey from London to San Francisco using an iPad Air using the Sketch Club app and Pencil by 53. Click on the video below to see stroke by stroke build up of the painting. 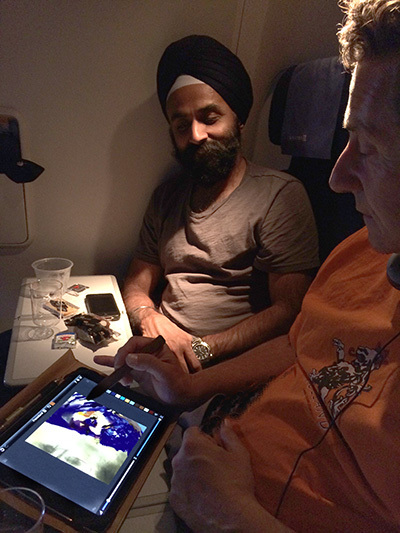 My subject, Ishmeet, was a passenger who happened to be sitting next to me on the journey. I don’t think he quite knew what he was letting himself into when I asked if I could draw his portrait… he ended up sitting still for almost 45 minutes! I love using Sketch Club on the iPad. 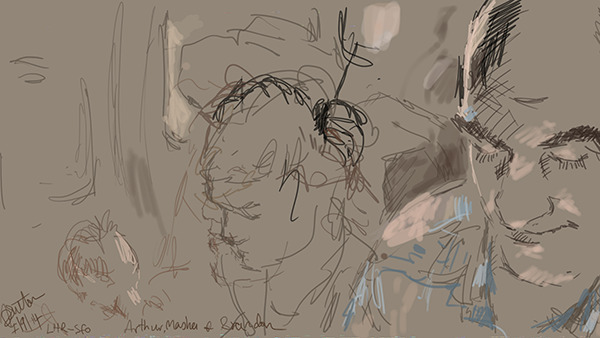 It’s a great app for sketching and provides you with the opportunity to record and replay the painting and export it with music as an mp4 file (see the replay movie at top of this page). If you’re interested to learn how to use Sketch Club and sketch on the iPad then please join my next Paint on the Go! one day workshop here in my studio in San Francisco. To see more examples of my mobile digital art please visit my Mobile Digital Art page. 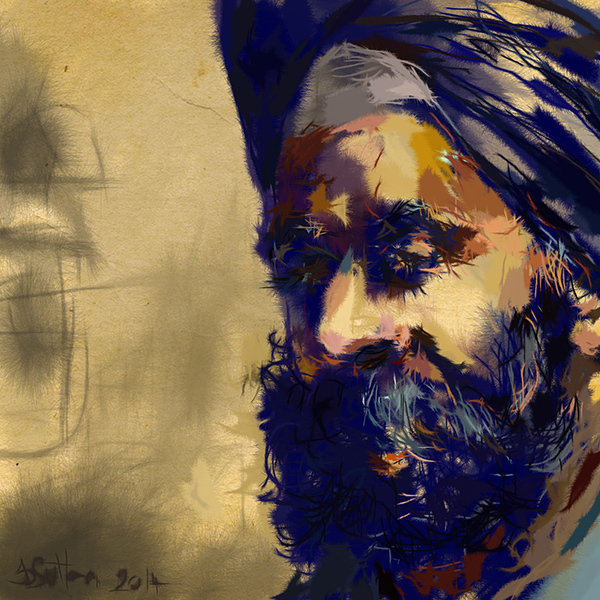 After I finished the portrait of Ishmeet the gentleman sitting behind us, artist Brandon Jones, showed me his Wacom Cintiq Companion Hybrid on which he was using the app ArtFlow to sketch with. 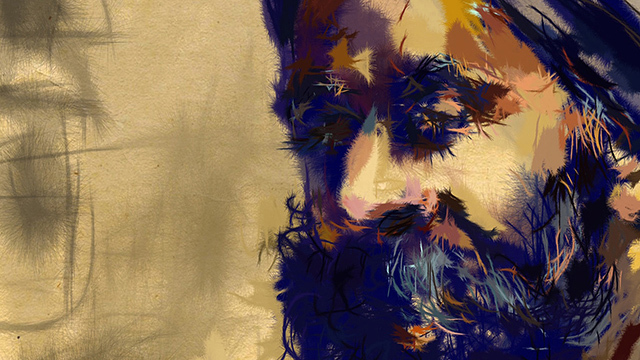 We swopped tools and he painted me on my iPad while I painted him on his Wacom CC Hybrid in a “draw off”! Neither of us had used the other’s platform or app before so it was very fun! This is my sketch of Brandon and his family. I thoroughly enjoyed this post, from the start-to-finish process video to the playful app swap at the end. Not to mention that the finished work is beautiful.